FRONT ROYAL, VA — When I was growing up, extraterrestrials were all the rage. George Adamski held millions in thrall recounting his travel with Orthon, Zuhl, and a bunch of other Venusians touring L.A. who let him tag along in their flying saucer while they tiptoed through the universe. Some ten years later, the brilliant philosopher Eric Voegelin startled his undergraduate students at Notre Dame with the offhand observation that flying saucer addicts were victims of the gnostic temptation. The "tension of existence," he explained, was too demanding for many earthlings to bear. They long for a flying saucer to land on the White House lawn and resolve the tension between good and evil, Heaven and earth, God and man, and sin and sanctity. "Klaatu Barada Nikto," said Patricia Neal – just in the nick of time – in The Day The Earth Stood Still. Gort, a mechanized rendition of the Last Judgment, was about to blow the world away because we fought wars and stuff. When he heard "Barado Nikto," Gort hung up his cosmic blaster, but he also hung around. One false move, people, and he'll fry the world. Rousseau was right — we can be forced to be free! Catholic author Michael O'Brien (Father Elijah; Eclipse of the Sun) has employed the future fiction genre with supple dexterity over the years. His latest, Voyage to Alpha Centauri [Ignatius Press] delivers a message that Voegelin would appreciate: wherever you go, there are no extraterrestrials: only us. And there are no false saviors — only the real One. The "existential tension" is there at the end — and yet, there can be happy endings. 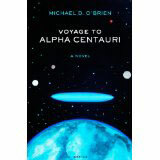 Earth's finest brains journey on a space ship towards a habitable planet orbiting Alpha Centauri. O'Brien describes the oppressive boredom of the nine-year journey almost too well – the first hundred pages are a hard slog – but hang in there. Things pick up as his version of C.S. Lewis's N.I.C.E (in That Hideous Strength) weighs in, complete with the Satanic horde (but without Fairy Hardcastle). Like Adamski, O'Brien has a hard time making up stuff about space ships. His forays into physics sometimes obscure his mastery of philosophical spiritual anthropology, but his perceptive imagination comes shining through with a profoundly original twist. It'll take a weekend and a cheerful fire, but it's worth the read. Public schools teach kids to "feel good about themselves," which is a disservice to education (as well as the kids). But one of America's premier educators, Father Jim Schall, S.J., insists that there are pleasures that are quite reasonable (and not all of them are "feelings," either). Pleasures abound when everything is in its place and we do the right thing. Even Aristotle liked sports, Father Schall observes, and we should take pleasure in them. There are some surprises: curiously, there is even a "reasonable side of Hell" (how pleasant!) — because its very existence affirms both our human nature (and our free will) and invites us all the more to take pleasure in the firm knowledge that the Incarnation happened. In fact, we can enjoy a distinct pleasure in the myriad activities of our minds, from the application of principle in practical pursuits to man' highest calling, contemplation of the good, the true, and the beautiful. The act of understanding itself can bring on a wave of unanticipated pleasure. Who has not had the experience of sitting in a classroom or in conversation and having a "light-bulb moment" that is as pleasurable as it is exciting and unforgettable? Father Schall was a teacher of political theory for most of his adult life, and in spite of politicians, he finds in politics much that might bring on pleasures that are in a class by themselves. Among them is the natural harmony — most pleasurable! — that accompanies the virtuous action that affirms the order of society and that of the soul. As Aristotle and Tocqueville observe, as long as a community has a common notion of "the good," participation in the life of the polis is pleasurable. It's when "diversity" demands that we all hail a myriad of contradictory "goods" that political life becomes distinctly un-pleasant. Edmund Burke wrote that our passions forge our fetters. Newt Gingrich says it's the "prison guards" — regulators and bureaucrats, but also entire professions and elite institutions — that should go the way of the buggy whip and whale oil industries. Our current system pays the prison guards plenty, Newt explains. His chapter on disability scams is worth the price of the whole book. There he recounts how Rep. Tammy Duckworth, a double amputee and Iraq War veteran, grills one Braulio Castillo, who got $500 million in preferential government contracts as a "disabled veteran" because he hurt his ankle playing football at West Point. The most helpful analysis of the Supreme Court's intrusion into just about everything is Phyllis Schlafly's classic, The Supremacists. She understands human nature (for lawyers, that's usually an impediment) and the Constitution (ditto), so her analysis is original and profound. Unlike so many commentators whose knees jerk to approve the latest "precedent," Mrs. Schlafly understands what Augustine calls the libido dominandi — the lust for power — and that understanding informs her account of lack of judicial restraint throughout. By the way, Mrs. Schlafly opposes the calling of a constitutional convention to redress the government's pervasive invasion of American life. 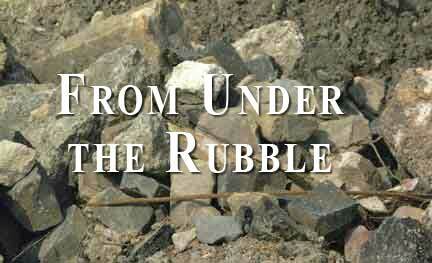 The Rubble agrees. Unintended and uncontrollable consequences would abound.